September 30, 2011  The U.S. sold bunker buster bombs to Israel in 2009, a recent report details. No U.S. officials have talked openly about why the bunker busters were provided to Israel but speculation falls most heavily on the Iranian nuclear program. 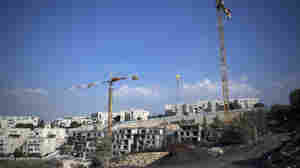 September 27, 2011  The move will complicate any peace negotiations, because the Palestinians want that area to be the capital of their future state. September 26, 2011  The Turkish prime minister says Syria's Bashar Assad has become "increasingly aggressive and violent." Recep Tayyip Erdogan also reiterates his demand that Israel apologize for the deadly raid at sea that killed nine Turks last year. September 26, 2011  Steve Inskeep talks to Robert Malley of the International Crisis Group about NPR's interview with Turkish Prime Minister Recep Tayyip Erdogan. September 25, 2011  The Palestinian push for statehood recognition has sparked fears of new violence in the West Bank. Neither Palestinians nor Israelis appear content with the security provided by their own governments, and "Neighborhood Security Watch" groups have been formed by both groups. While settlers are trained by the Israeli Defense Forces, Palestinians are forming teams to monitor, document and detain settlers they believe will seek out attacks. Sheera Frenkel reports. September 24, 2011  Two years ago, the Obama Administration secretly authorized the sale of 55 deep-penetrating bombs — or bunker busters — to Israel. That's according to an investigation by Newsweek magazine. 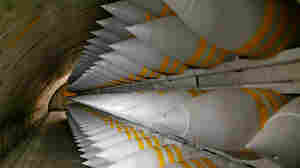 The bombs could potentially be used in Israeli attack on Iranian nuclear sites. Weekends on All Things Considered host Guy Raz talks with Eli Lake, the reporter who broke the story. September 24, 2011  Another government shutdown could be looming, the state of Georgia goes ahead with the controversial execution of Troy Davis and overseas, Vladimir Putin announces he's taking another run at the Russian presidency. Weekends on All Things Considered host Guy Raz and the Atlantic's James Fallows get behind the headlines of the week's biggest news. September 24, 2011  Tens of thousands of Palestinians across the occupied West Bank took to the streets Friday night to celebrate their formal bid for statehood at the United Nations. Watching on large television screens set up in city squares, Palestinians reacted with joy at the uncharacteristically impassioned speech given by Palestinian leader Mahmoud Abbas. From Ramallah, NPR's Lourdes Garcia-Navarro talks with host Scott Simon. Double Take 'Toons: Two Nations, Indivisible? September 24, 2011  Palestinian President Mahmoud Abbas' bid to have Palestine declared an independent state has sparked a furor. Hajo De Reijger accuses America of scheming with Israel to block the proposal, while Patrick Chappatte thinks that President Obama is more a plodder than a plotter. September 23, 2011  Palestinians react to their leader's bid for statehood recognition at the United Nations. Mass rallies are planned across the West Bank. Melissa Block talks to NPR's Lourdes Garcia-Navarro. 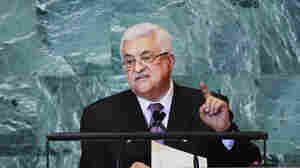 September 23, 2011  The president of the Palestinian Authority has asked the U.N. to recognize his state. 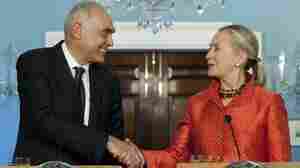 The Israelis say such a move would violate past agreements and are threatening retaliation. U.S. and European diplomats are scrambling to head off what could be a diplomatic train wreck. September 23, 2011  Rebuffing the United States and Israel, Palestinian Authority President Mahmoud Abbas submitted an application, asking the United Nations to recognize Palestine as a member state.